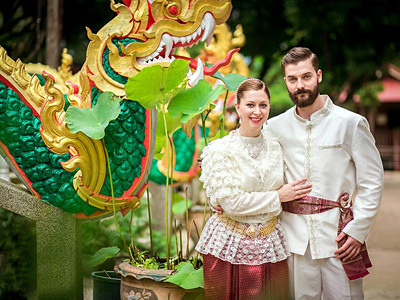 Celebrate your wedding in a traditional Thai ceremony. Sacred chanting of Buddhist monks is the evocative soundtrack to a meaningful union. As the symbolic gesture of well wishing, holy waters are poured on your hands. The union of your souls is completed amidst tropical gardens and the tranquil beach of New Star Beach Resort – Koh Samui. Long drum parade; the wedding begins once the groom, accompanied by the celebrant, leads the colorful \”Long Drum Parade\” to where the vows will take place. Ate the entrance, two friends or relatives of the bride are holding a golden ribbon to block the way. After giving them a symbolic token, the groom gets to enter the venue. Buddhist ceremony; go to the temple for monk’s chants prayers of health, happiness and prosperity for the wedding couples’ marriage. Watering ceremony (Rod Naam Sank); this symbolizes their spiritual union. Flower garlands are presented and powder is placed on the forehead. They then \”Wai\” by clasping their palms together in the traditional prayer-like gesture while one by one of guests pour a conch shell full of sacred water over the couple’s hands while saying a blessing for good luck.